Prof. Dr. Ing. Miroslav Svítek, dr.h.c., FEng., EUR ING was born in Rakovník, Czech Republic, in 1969. He graduated in radioelectronic from Czech Technical University in Prague, in 1992. In 1996, he received the Ph.D. degree in radioelectronic at Faculty of Electrical Engineering, Czech Technical University in Prague. 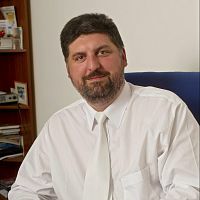 Since 2002, he has been associated professor in engineering informatics at Faculty of Transportation Sciences, Czech Technical University in Prague. Since 2005, he has been nominated as the extraordinary professor in applied informatics at Faculty of Natural Sciences, University of Matej Bel in Banska Bystrica, Slovak Republic. Since 2008, he has been full professor in engineering informatics at Faculty of Transportation Sciences, Czech Technical University in Prague. Miroslav Svítek is president of Czech Smart City Cluster (www.czechsmartcitycluster.cz), president of Association of transport telematics (www.sdt.cz), president of National association for electromobility (www.narodni-spolek.cz), member of Engineering academy of the Czech Republic (www.eacr.cz) and Dean of Faculty of Transportation Sciences, Czech Technical University in Prague (www.fd.cvut.cz). He is currently teaching courses and doing research in smart cities, theoretical telematics, intelligent transport systems, system theory and informatics. He is author or co-author of more than 250 scientific papers and 10 monographs. INSPIRELI AWARDS is open to contestants under the age of 35. We hope you can join us!